Dr. MacGill is board certified by The American Board of Foot and Ankle Surgery in foot surgery as well as reconstructive rearfoot and ankle surgery, the latter of which is only achieved by a fraction of the current practicing foot and ankle surgeons in the country. Dr. MacGill is one of a handful of surgeons in the Tri-county area currently performing total ankle replacement with preoperative computerized tomography (CT) -guided navigation and custom cutting guides: a technological evolution that enhances implant position and ultimate longevity of the new joint. He is a Fellow of the American College of Foot and Ankle Surgeons (ACFAS) and has volunteered and served as the Chair of the Consumer Education Committee for many years. He currently serves as the Southeast Region President of ACFAS which oversees Florida, Georgia, and Puerto Rico. A native of Florida, Dr. MacGill grew up in Tampa and attended the University of Florida in Gainesville. He majored in Pre-Medical studies and minored in Sociology, earning his Bachelor of Science degree with honors. He then attended The William M. Scholl College of Podiatric Medicine at Rosalind Franklin University in North Chicago, Illinois. He graduated in the top 10th percentile of his class and matched with his first choice for residency at Florida Hospital in Orlando, Florida; a top-tier foot and ankle surgical residency in Florida by case volume and diversity. During his residency, he completed numerous additional surgical training courses with an emphasis on adult and pediatric reconstructive surgery, external fixation, ankle arthroscopy, lower extremity trauma, and diabetic limb salvage. In 2007, Dr. MacGill was selected for the prestigious AO International Trauma Fellowship with Sigvard Hansen, Jr., MD, Chairman Emeritus-Orthopedics at the University of Washington’s School of Medicine. Dr. MacGill completed his fellowship in the spring of 2009, gaining additional training in total ankle replacement as well as complex Charcot foot and ankle reconstruction. Dr. MacGill is the Director of the Foot and Ankle Surgery residency program at Northwest Medical Center in Margate, FL and previously served as Assistant Director and Research Director for the Bethesda Health Foot and Ankle Surgery residency program in Boynton Beach, FL. He participates in weekly didactic lectures, surgical grand rounds, journal club meetings, and cadaver lab workshops with the residents and students. He has also published several articles in peer-reviewed journals, given award-winning case presentations at state scientific meetings, presented numerous scientific research posters and lectured at both state and national conferences. Dr. MacGill is also a Certified Wound Specialist (CWS) by The American Board of Wound Management and treats problematic lower extremity wounds both in the office and at the Broward Health Wound Care & Hyperbaric Medicine Center in Coral Springs, FL. The center achieved the “Center of Distinction” award for the 8th consecutive year and the “Center of Excellence” award for the 6th consecutive year. Both awards are given for exceeding benchmarks for healing and patient satisfaction. Furthermore, Dr. MacGill is a member in good standing with the American Podiatric Medical Association, the Florida Podiatric Medical Association, and is a former officer of the Palm Beach County Podiatric Medical Association. In his spare time Dr. MacGill enjoys running, cycling, participating in triathlons, softball, golf and going to the beach with his wife and two children. 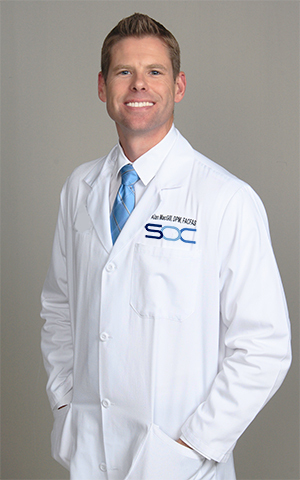 Dr. Alan MacGill patients can visit him at Spine & Orthopedic Center in our 4 different locations. For more information, please call 24/7 at 1-888-409-8006 or fill out our appointment request form.